Objective: To study the foveal displacement during the closure of idiopathic macular holes (MHs). Methods: Thirty-seven idiopathic MH patients treated by pars plana vitrectomy and internal limiting membrane peeling were studied prospectively. Locations of MH center and foveal pit were measured by optic coherence tomography. Retinal displacement was observed using confocal scanning laser ophthalmoscopy. Results: A total of 40 eyes were included in this study and MHs were closed in 37 eyes (92.5%). The confocal scanning laser ophthalmoscopy showed that all of the retinal capillaries in the superior, inferior, nasal and temporal sides of the MHs moved toward the optic nerve head (ONH). The optic coherence tomography results showed that the mean nasal displacements of foveal pits were (102.9±61.2), (109.6±53.1), and (137.0±52.0) μm at 3, 6 and 12 months, respectively. And the mean vertical displacements were (55.9±49.4), (61.4±57.8) and (67.8±54.3) μm, respectively. Post-operative foveal pits were located in the nasal side of the MH centers. The extension of retina and nasal to the MH were in opposite directions: the nasal hole margin moved toward the MH, but the retina located closer to the ONH moved toward the ONH. The fellow eyes of three patients developed into idiopathic MH during the follow-up period and operations were performed for all of the three patients. Conclusion: Our results showed that center of macula does not move when an idiopathic MH develops, but it moves toward ONH during closure of hole; thus, new fovea is in nasal side of original fovea. Idiopathic macular hole (MH) is a vision-threatening disease mainly affecting middle-aged to elderly females. In 1991, Kelly and Wendel first reported surgical closure of idiopathic MH using pars plana vitrectomy. In 1996, Yooh et al. introduced internal limiting membrane (ILM) peeling in idiopathic MH surgery. Thereafter, pars plana vitrectomy with ILM peeling becomes common clinical surgical method widely used in treatment of idiopathic MH,. Perifoveal vitreous cortex generated tangential traction on fovea and detached from fovea during formation of an idiopathic MH,. With continuous tangential traction and progressive posterior vitreous detachment, a full-thickness idiopathic MH develops. The hole starts from a dehiscence in the outer retina,, and heals from the inner retina,,, which indicates that displacement of the inner retina is important for hole closure. A MH is closed by centripetal movement of the surrounding retina,,. Several studies found macula moved toward optic nerve head (ONH) after hole closure due to movement of retinal vessels [12,14-16]. Foveal pit is avascular, and retinal capillaries in perifoveal area are too small to be clearly seen. Small retinal vessels can be seen near MH, but ring-shaped retina surrounding MH (hole margin) contains no visible vessel. When a MH is closed, displacement of this “avascular” hole margin might not be the same as the movement of retinal vessels. This study aimed to study the exact movement of macula during closure of an idiopathic MH. We first superimposed pre-and postoperative confocal scanning laser ophthalmoscopy (cSLO) images to detect the movement of retinal capillaries. Then we compared the location of pre-operative MH center and the post-operative foveal pit using optic coherence tomography (OCT). An unexpected finding was the development of idiopathic MH in the fellow eyes of three patients, which enabled us to compare the location of the original macula and macula after MH was closed. This is a prospective case series at Eye and Ears, Nose, and Throat Hospital, Fudan University, Shanghai, China. Permission for medical record review was obtained by the institutional review board of the hospital. This study was conducted in accordance with the ethical standards stated in the Declaration of Helsinki and was approved by the Institutional Review Board (IRB) / Ethics Committee of Eye and Eye and Ears, Nose, and Throat Hospital of Fudan University (NO. KJ2009-16). Informed consents were received from all the patients. Patients who were clinically diagnosed as stage 3 or 4 idiopathic MH by clinical examination and OCT and also had a spherical equivalent correction of +1.00 to -6.00 diopters were included,,,. Patients with a history of any ocular disorders affecting retinal structure or visual function, including rhegmatogenous retinal detachment, excessive cataract, corneal diseases, diabetic retinopathy, macular degeneration, or myopic chorioretinal atrophy, were excluded. All patients underwent a group of bilateral ophthalmic examination at base line and 3, 6, and 12 months after surgery. The examinations included bilateral slit-lamp biomicroscopy, indirect ophthalmoscopy, and intraocular pressure. Best corrected visual acuity (BCVA) was measured using the ETDRS retro-illuminated chart and was converted to logarithm of minimum angle of resolution units for statistics. Displacement of the macula was analyzed by infrared fundus images using the cSLO (Spectralis, Spectralis HRA+OCT, Heidelberg Engineering, Heidelberg, Germany). To display subtle positional changes of the retinal capillaries, cSLO images of two different visits were merged via the composite function of the Spectralis according to the manufacturer's instructions. One of the infrared images was further transferred into false red color. Displacement of the macula was confirmed by non-overlapping retinal vessels. Both eyes were examined. Since the MH and hole margin contained no visible retinal vessels on the cSLO images, MH center and post-operative foveal pit were used as references. Two orthogonal OCT volumes (vertical and horizontal volumes) (Spectralis) were used to examine the MH and the surrounding retina. Detailed procedures were illustrated in [Figure 1]. Briefly, each OCT volume contained 131 B-scan lines (from No. 1/131 to 131/131). Spacing between adjacent B-scan lines was 12 μm. B-scan lines showing the beginning of a continuous neurosensory retina were determined as the MH boundaries. Each MH had four boundaries: the superior and inferior boundaries were selected from the horizontal OCT volume, and the nasal and temporal boundaries were selected from the vertical OCT volume. Midline of the horizontal boundaries and that of the vertical boundaries were determined as the MH center. Refer to our previous work, MH apical diameter was measured on the B-scans passing through the MH center. Figure 1: Procedures of the optic coherence tomography (OCT) volumes. This is the right eye of patient #20. Before surgery, a horizontal OCT volume (A) and a vertical OCT volume (B) are used to scan the macular hole (MH). On post-operative visits, both OCT volumes were used to scan the macula in the “follow-up” mode (C and D). Each OCT volume contains 131 B-scan lines (from No. 1/131 to 131/131). The numbering sequence is upward in the horizontal volume (A and C) and leftward in the vertical volume (B and D). E, F and G: Three consecutive B-scans show serial changes of the neurosensory retina from interruption to continuity. The retina becomes continuous in the B-scan No. 79/131 (F). The B-scan No. 78/131 shows an MH (E) and the B-scan No. 80/131 shows a continuous retina (G). As a result, the B-scan No. 79/131 was determined to pass through the superior boundary of the MH. H, I and J: CRT is the smallest distance from internal limiting membrane to Bruch's membrane. CRT in the B-scan No. 50/131 (H), 51/131 (I), and 52/131 (J) is 224, 211, and 215 μm, respectively. Other B-scans of the same OCT volume have greater CRT. Hence the B-scan No. 52/131 was determined to pass through the foveal pit. In the right eye of patient #20, the B-scans No. 79/131, 45/131, 41/131, and 81/131 pass through the superior, inferior, nasal, and temporal MH boundaries. The horizontal B-scan No. 62/131 [(79+45)/2] and vertical B-scan No. 61/131 [(41+81)/2] were determined to pass through the MH center. On the postoperative visit of 12 months, the horizontal B-scan No. 69/131 and vertical B-scan No. 51/131 were determined to pass through the foveal pit. Since spacing between adjacent B-scans was 12 μm, foveal pit moved superiorly by 84 μm [(69–62)× 12 μm] and moved nasally by 120 μm [(61–51)× 12 μm]. After MH was closed, the OCT volumes were performed in the follow up mode. In each B-scan, the ILM and Bruch's membrane were delineated automatically by a thresholding algorithm searching for the change of reflectivity at the retinal interfaces. Each B-scan contained a central retinal thickness which measured the smallest distance from ILM to Bruch's membrane. In each OCT volume, the smallest central retinal thickness showed by the B-scan lines was determined as the foveal pit. Locations of the MH center and foveal pit were compared, and their distance was calculated. If a MH was not closed, locations of the pre-and the post-operative MH centers were compared. In the fellow eyes, locations of the foveal pit on each visit were compared. Changes of their locations indicated the measurement error of the OCT volume scanning. All pars plana vitrectomies were performed by one operator (G. X.) using a 23-gauge transconjunctival sutureless vitrectomy system (Constellation, Alcon Laboratories Inc., Fort Worth, TX, USA). Cataract surgeries were performed on patients over 55 years old via the phacoemulsification system (Constellation) with implantation of foldable intraocular lens (AcrySof, Alcon Laboratories Inc.). Triamcinolone acetonide (Bristol-Myers Squibb, Italy) was used to stain the posterior vitreous cortex. Brilliant blue G (Fluoron GmbH, Neu-Ulm, Germany) was used to stain the ILM. The ILM was peeled anticlockwise (in the operator's view) in all the operations. The area of ILM peeling was confined by the superior and inferior vascular arcades, optic disc, and temporal retina of two papilla diameters to the hole. Cares were taken to peel toward (not away from) the hole, avoiding an inadvertent enlargement of the hole. All patients were 20% sulfur hexafluoride tamponade and took a face-down position for 5 d.
Datum of BCVA, macular hole diameter, and foveal displacement were analyzed using the SPSS software (version 15.0 for Windows). Mann Whitney U test and Wilcoxon Signed Ranks test were used for comparisons, and nonparametric Spearman's test was used for establishment of correlations. Values were reported as mean±standard deviation (SD). P<0.05 was considered to indicate a significant difference. Thirty-seven idiopathic MH patients (29 women and 8 men) who met the eligibility criteria were included in this study. Mean age was 59.4 years (age range of 45–69 years). All patients had unilateral idiopathic MH on the first visit. The fellow eyes of three patients developed into idiopathic MH and received operations. So, a total of 40 eyes were operated. MHs were closed in 37 eyes (92.5%). Mean spherical equivalent correction was -0.78 diopters (range of -3.00 to +1.00 diopters). Mean axial length was 23.90 mm (range of 22.80 to 24.60 mm). Intraocular pressure was 12.9 mmHg (range of 10.5–17.3 mmHg). BCVA at base line ranged from 20/800 to 20/32, and the post-operative BCVA at 12 months ranged from 20/100 to 20/20. BCVA was elevated by 5.4 lines (range of 1–10 lines). A total of 30 eyes (from 27 patients) were operated by vitrectomy with implantation of foldable intraocular lens and 10 eyes (from 10 patients) were remained phakic. All patients were followed up over 12 months. No complications were found, including intraoperative bleeding, iatrogenic retinal hole, intraocular hypertension (over 21 mmHg), MH reopening, hyphema, retinal detachment, glial recurrence, or vitreous hemorrhage. 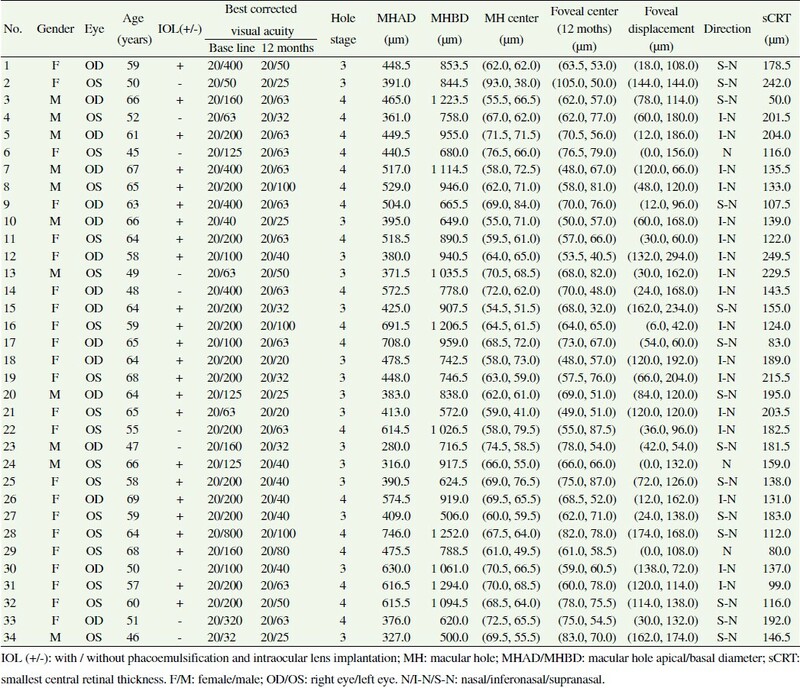 Demographics of the patients with successful surgeries (37 eyes) are summarized in [Table 1]. Compared with their pre-operative locations, retinal capillaries in the superior, inferior, nasal and temporal sides of the MHs all moved toward the ONH. Vascular movement was obvious on the first post-operative visit and disappeared thereafter [Figure 2]. Both phakic and pseudophakic eyes showed the same vascular movements and the fellow eyes showed no vascular change [Figure 3]. Results of the OCT volumes showed that the post-operative foveal pits were located in the nasal side of the MH centers in all the 37 eyes. Mean nasal displacements were (102.9±61.2), (109.6±53.1), and (137.0±52.0) μm at 3, 6 and 12 months, respectively. Mean vertical (superior or inferior) displacements were (55.9±49.4), (61.4±57.8) and (67.8±54.3) μm, respectively. Nasal displacements were significantly higher than the vertical displacements (P<0.001). No differences were found between the superior and inferior displacements. Table 1: Foveal displacement in patients whose macular holes were closed. Figure 2: Movement of the retinal vessels after macular hole is closed. This is a 56-year-old female (patient #4) with a stage 4 macular hole in her left eye (A). 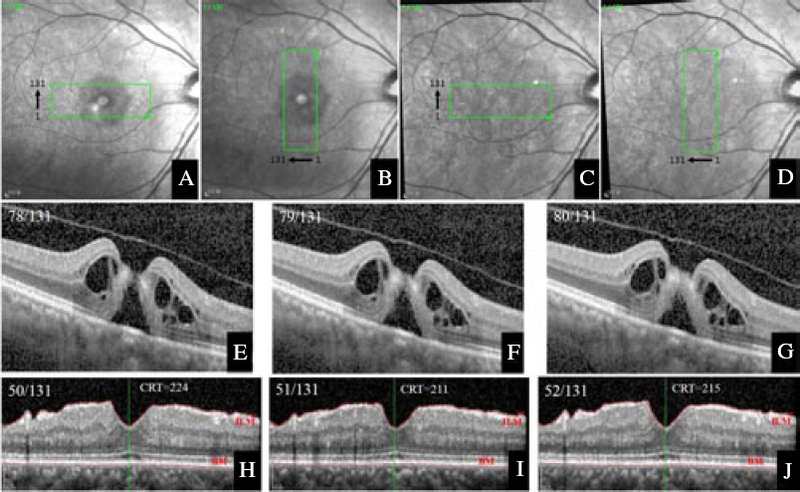 Confocal scanning laser ophthalmoscopy images before surgery (A) and 3 (B), 6 (C), and 12 months (D) after surgery were presented. Images on 3 and 12 months were transformed into false red color (B and D). After the macular hole was closed, small vessels in the superior, inferior, and temporal sides of the hole all moved toward the optic nerve head (black arrows). Retinal vessels in the nasal side of the hole also moved toward the optic nerve head (black arrow heads). The vascular arcades were fixed (white arrows) (E). The vascular movements were obvious on 3 months (E) and stabilized thereafter (F and G). On the first visit, optic coherence tomography shows attachment of the posterior hyaloid to the fovea (A). On 12 months, the posterior vitreous detaches from the fovea (white arrow) (B). 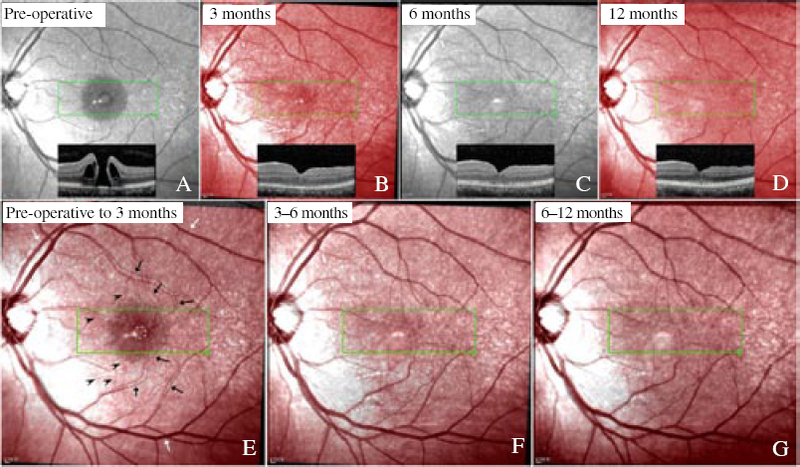 The composite confocal scanning laser ophthalmoscopy image shows no vascular change (C). In the fellow eyes, foveal pits at the first visit were not in the same locations of those at the follow-up visits. Mean horizontal displacements (both nasal and temporal displacements) were (15.3±4.5), (13.7±4.7) and (12.9±5.5) μm at 3, 6 and 12 months, and vertical displacements were (15.6±4.1), (13.6±5.2) and (12.1±6.3) &3956;m, respectively. Displacements of the foveal pits in the fellow eyes were significantly smaller than those in the operated eyes (P<0.001). Horizontal and vertical MH diameters were (477.9±127.6) and (454.4±116.6) μm, respectively. Horizontal diameter was significantly longer than the vertical diameter (P=0.005), which indicated a horizontally ellipsoid shape of the MHs. At all postoperative visits, radiuses of the MHs were significantly longer than the distances between MH centers and post-operative foveal pits (P<0.001), which indicated that post-operative foveal pits lied within the confine of the MHs. On the first visit, the fellow eyes of three patients (No. 1, No. 17, and No. 31) showed normal macular structures and the posterior hyaloids attached to the foveae. However, idiopathic MH developed spontaneously at the observation of 16 to 26 months. The cSLO images showed that the retinal vessels did not move when the idiopathic MH developed, but they moved toward the ONH when the MHs were closed [Figure 4]. OCT scanning demonstrated that the MH centers were almost in the same place of the original foveal pits, but the post-operative foveal pits were on the nasal side of the MH centers. On the first visit, her left eye showed normal macular structures with attachment of the posterior hyaloid to the fovea (A). Twenty-six months later, she complained of metamorphopsia in her left eye and was diagnosed stage 3 macular hole (B). She received operation and the hole was closed (C). Confocal scanning laser ophthalmoscopy images show that the retinal vessels do not move when the macular hole develops (D) but move toward the optic nerve head after the hole was closed (E, arrows). MHs were not closed in three patients. At 12 months, the MHs were enlarged and the macular edemas were aggravated. The cSLO images showed that the retinal vessels around the hole moved toward the ONH [Figure 5]. The OCT images revealed that the nasal hole boundary moved more nasally compared with its pre-operative location. Figure 5: Vascular movements in patient #35 whose macular hole is not closed. This is a 56-year-old female patient (#35) with stage 3 macular hole in her left eye (horizontal macular hole diameter: 580 μm) (A). She was operated but the macular hole did not close. Compared with the first visit, the macular hole enlarged and edema of hole margin aggravated at 12 months (white arrow, macular hole diameter: 713 μm) (B). Confocal scanning laser ophthalmoscopy image shows that the retinal vessels move toward the optic nerve head (arrows) (C). In the present study, we found that the macula did not move when the MH formed but moved toward the ONH during MH closure. Post-operative foveal pit lied in the nasal side of the original foveal pit, within the confine of the hole. Several studies found macula moves toward ONH after MH is closed by vitrectomy and ILM peeling,,. In those studies, displacement of retina was detected by observing the movement of retinal vessels. Ishida et al. measured the distances between ONH and intersection of temporal and nasal vessels before and after macular hole closure. They found that both temporal and nasal retinal vessels displace toward the optic disc. Displacement of the temporal vessels was longer than that of the nasal vessels. In that study, however, difference in the changes of temporal and nasal was smaller than the MH diameter. This means that if displacement of the vessels is equal to that of MH margin, it will be insufficient for the hole to be closed. Actually MHs were all closed in that study. This implies that displacement of the fovea might not be exactly equal to the displacement of retinal vessels. The center of the fovea was avascular, and the parafoveal retinal capillaries were too small to be clearly seen on fundus images. Visible retinal vessels could only be found in the farther area. In a MH, the hole margin always contained no visible vessels. During MH closure, displacement of the hole margin might not be exactly the same as the movement of the visible vessels. In this study, locations of the MH boundaries, MH centers, and foveal pits were determined by OCT volumes scanning. According to their locations, displacement of the “avascular” fovea can be conjectured. We found that the post-operative foveal pit moved to the nasal side of the MH center and was still within the confine of the hole. This indicated that although the retinal vessels moved toward the ONH during hole closure, the nasal hole boundaries could move toward the hole center, just opposite to the movement of the retinal vessels. Temporal elongation of the nasal hole margin helps to close the hole. In three patients, the MHs were not closed. The holes were enlarged, and the nasal boundaries did not move toward the hole center but moved toward the ONH. This might be one of the causes leading to a failed MH surgery. Prevention of the nasal hole boundary to move toward the ONH might elevate the success rate of the MH surgery. The neurosensory retina is elastic and can change its place under external forces. In rhegmatogenous retinal detachment, the retina moves downward due to the gravity. In epiretinal membrane, the fovea is distorted and pulled by the membrane,. MH closure would not be the prerequisite for the nasal foveal displacement, because the fovea can also move nasally in the eyes with unclosed hole and in DME treated by vitrectomy. We suggested that the foveal displacement could be caused by removal of the ILM. There are two reasons to support our suggestion: 1) The ILM is rigid and reduces the elasticity of retinal tissues. Removal of the ILM might relax the retina and reduce the structural supports by injuring the Müller cells, then the retina is free to move. 2) In eyes with DME, removal of the posterior hyaloid without ILM peeling does not lead to foveal displacement, but eyes with ILM peeling show obvious nasally foveal displacement. There has no definitive explanation why ILM peeling induces a nasal movement, rather than a random movement of fovea. A possible reason might be that ILM peeling causes mechanical damages on the inner retina. This could induce depolymerization of microtubules in the nerve fiber,, and make the axons shrink. The optic nerve fibers are tethered to lamina cribrosa, and shrinkage of these fibers might pull fovea toward optic disc. Although ILM peeling significantly improves the rate of MH closure, the peeling is not imperative since MHs can still be closed without peeling,, even without treatment,,. We presumed that ILM peeling on the nasal retina should be avoided, which, theoretically, could alleviate the damage of the inner retina, obviate axon shrinking, and prevent retraction of the nasal retina. Another discovery in this study is that the macula did not move when the macular hole developed. After the hole was closed by vitrectomy with ILM peeling, the macula moved nasally and a new foveal pit formed in the nasal side of the original one. ILM peeling might lead to irreversible damage to the macula, since it causes foveal dystrophia. Less destructive procedures such as ocrioplasmin might be a substitution. More work is needed to verify our presumption. One limitation of this study is that the OCT examination is based on the Spectralis HRA+OCT. The measurement error should be considered since it greatly influences the results. The Spectralis has two special technologies. The “TruTrack” technology (a real-time eye-tracking system) tracks involuntary eye movements and locks each OCT B-scan to its correct position in sub-pixel accuracy, enabling highly precise and repeatable alignment of B-scan with the fundus. And the “Auto-Rescan” technology eliminates subjective operator placement and places follow-up B-scans in precisely the same location as baseline scans. The Spectralis offers the smallest measurable change (one micron) among several modern OCT instruments. As far as we know, measurement error of these two technologies has not been definitively reported. Theoretically, the foveal pit does not move if no maculopathy develops. In this study, however, we found that the location of the foveal pit at the first visit was not exactly met with that at the follow-up visit in the normal fellow eyes. Difference in their locations should be the measurement error. Displacement less than measurement error should not be a true displacement. In this study, displacement of the foveal pit in the operated eyes was significantly greater than that in the normal fellow eyes. Hence, the OCT volumes used in this study offered reliable results. In conclusion, we found that the macula does not move when the MH develops but moves toward the optic disc when the hole is closed. The new foveal pit is located in the nasal side of the original foveal pit. This work was supported by National Basic Research Program of China (973 Program, No. 2013CB967503), National Natural Science Foundation of China (No. 81170857), and Shanghai Key Laboratory of Visual Impairment and Restoration, Fudan University, Shanghai, China. Zhang P, Zhu M, Zhao Y, Qian J, Dufresne C, Turner R, et al. A proteomic approach to understanding the pathogenesis of idiopathic macular hole formation. Clin Proteomics 2017; 14: 37. Kelly NE, Wendel RT. Vitreous surgery for idiopathic macular holes. Results of a pilot study. Arch Ophthalmol 1991; 109(5): 654-659. Yooh HS, Brooks HL Jr, Capone A Jr, L’Hernault NL, Grossniklaus HE. Ultrastructural features of tissue removed during idiopathic macular hole surgery. Am J Ophthalmol 1996; 122(1): 67-75. Madi HA, Masri I, Steel DH. Optimal management of idiopathic macular holes. Clin Ophthalmol 2016; 10: 97-116. Gelman R, Stevenson W, Prospero Ponce C, Agarwal D, Christoforidis JB. Retinal damage induced by internal limiting membrane removal. J Ophthalmol. 2015; 2015: 939748. Gass JD. Idiopathic senile macular hole. Its early stages and pathogenesis. Arch Ophthalmol 1988; 106(5): 629-639. Johnson RN, Gass JD. Idiopathic macular holes. Observations, stages of formation, and implications for surgical intervention. Ophthalmology 1988; 95(7): 917-924. Chung H, Byeon SH. New insights into the pathoanatomy of macular holes based on features of optical coherence tomography. Surv Ophthalmol 2017; 62(4): 506-521. Faria MY, Ferreira NP, Mano S, Cristovao DM, Sousa DC, Monteiro-Grillo ME. Internal retinal layer thickness and macular migration after internal limiting membrane peeling in macular hole surgery. Eur J Ophthalmol 2017; 0: doi: 10.5301/ejo.5001066. Chhablani J, Khodani M, Hussein A, Bondalapati S, Rao HB, Narayanan R, et al. Role of macular hole angle in macular hole closure. Br J Ophthalmol 2015; 99(12): 1634-1638. Zhang W, Grewal DS, Jaffe GJ, Mahmoud TH, Fekrat S. Spontaneous closure of full-thickness macular hole with epiretinal membrane in vitrectomized eyes: Case series and review of literature. Ophthalmic Surg Lasers Imaging Retina 2017; 48(2): 183-190. Yun C, Ahn J, Kim M, Kim JT, Hwang SY, Kim SW, et al. Characteristics of retinal vessels in surgically closed macular hole: An optical coherence tomography angiography study. Graefes Arch Clin Exp Ophthalmol 2017; 255(10): 1923-1934. Rodrigues IA, Lee EJ, Williamson TH. Measurement of retinal displacement and metamorphopsia after epiretinal membrane or macular hole surgery. Retina 2016; 36(4): 695-702. Lee JJ, Lee IH, Park KH, Pak KY, Park SW, Byon IS, et al. Vascular displacement in idiopathic macular hole after single-layered inverted internal limiting membrane flap surgery. Korean J Ophthalmol 2017; 31(4): 336-342. 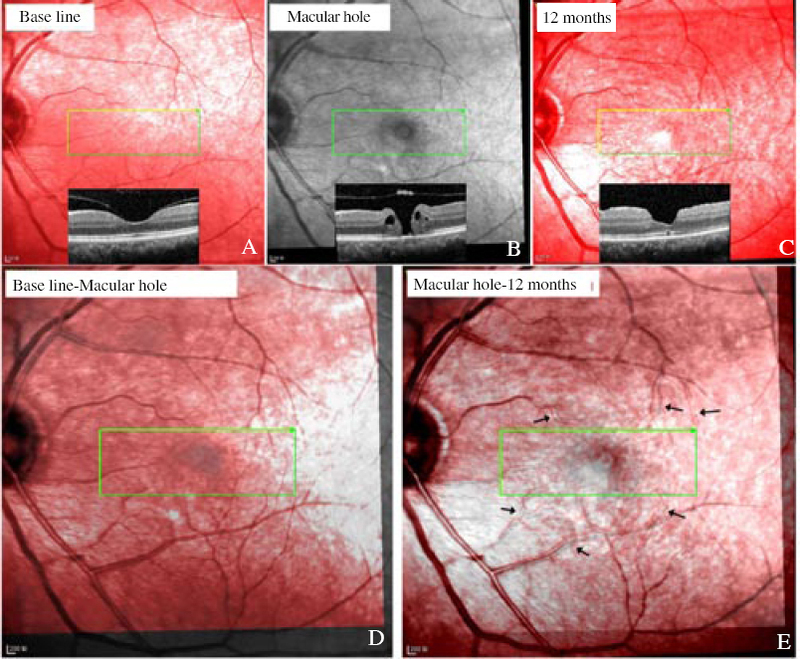 Baba T, Kakisu M, Nizawa T, Oshitari T, Yamamoto S. Superficial foveal avascular zone determined by optical coherence tomography angiography before and after macular hole surgery. Retina 2017; 37(3): 444-450. 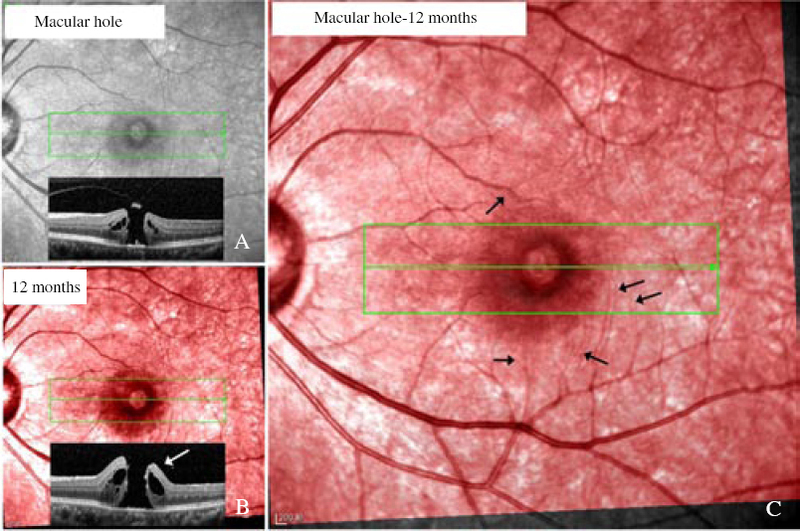 Cho JH, Yi HC, Bae SH, Kim H. Foveal microvasculature features of surgically closed macular hole using optical coherence tomography angiography. BMC Ophthalmol 2017; 17(1): 217. McDonnell PJ, Fine SL, Hillis AI. Clinical features of idiopathic macular cysts and holes. Am J Ophthalmol 1982; 93(6): 777-786. Avila MP, Jalkh AE, Murakami K, Trempe CL, Schepens CL. Biomicroscopic study of the vitreous in macular breaks. Ophthalmology 1983; 90(11): 1277-1283. Chatziralli IP, Theodossiadis PG, Steel DHW. Internal limiting membrane peeling in macular hole surgery; Why, when, and how? Retina 2017; doi: 10.1097/IAE.0000000000001959. Parravano M, Giansanti F, Eandi CM, Yap YC, Rizzo S, Virgili G. Vitrectomy for idiopathic macular hole. Cochrane Database Syst Rev 2015; 2015(5): CD009080. Sun Z, Gan D, Jiang C, Wang M, Sprecher A, Jiang AC, et al. Effect of preoperative retinal sensitivity and fixation on long-term prognosis for idiopathic macular holes. Graefes Arch Clin Exp Ophthalmol 2012; 250(11): 1587-1596. Ishida M, Ichikawa Y, Higashida R, Tsutsumi Y, Ishikawa A, Imamura Y. Retinal displacement toward optic disc after internal limiting membrane peeling for idiopathic macular hole. Am J Ophthalmol 2014; 157(5): 971-977. Bae K, Kang SW, Kim JH, Kim SJ, Kim JM, Yoon JM. Extent of internal limiting membrane peeling and its impact on macular hole surgery outcomes: A randomized trial. Am J Ophthalmol 2016; 169: 179-188.
dell’Omo R, Scupola A, Viggiano D, Sammarco MG, De Turris S, Romano MR, et al. Incidence and factors influencing retinal displacement in eyes treated for rhegmatogenous retinal detachment with vitrectomy and gas or silicone oil. Invest Ophthalmol Vis Sci 2017; 58(6): BIO191-BIO9. Hecht I, Yeshurun I, Bartov E, Bar A, Burgansky-Eliash Z, Achiron A. Retinal layers thickness changes following epiretinal membrane surgery. Eye (Land) 2017; doi: 10.1038/eye.2017.233. Gao M, Wang Y, Liu W, Liu L, Yan W, Liu J, et al. Assessment of macular function in patients with idiopathic epiretinal membrane by multifocal electroretinography: Correlation with visual acuity and optical coherence tomography. BMC Ophthalmol 2017; 17(1): 221. Vujosevic S, Torresin T, Berton M, Bini S, Convento E, Midena E. Diabetic macular edema with and without subfoveal neuroretinal detachment: Two different morphologic and functional entities. Am J Ophthalmol 2017; 181: 149-155. Shiode Y, Morizane Y, Matoba R, Hirano M, Doi S, Toshima S, et al. The role of inverted internal limiting membrane flap in macular hole closure. Invest Ophthalmol Vis Sci 2017; 58(11): 4847-4855. Kominami A, Ueno S, Kominami T, Nakanishi A, Piao CH, Ra E, et al. Restoration of cone interdigitation zone associated with improvement of focal macular ERG after fovea-off rhegmatogenous retinal reattachment. Invest Ophthalmol Vis Sci 2016; 57(4): 1604-1611. Yoshikawa M, Murakami T, Nishijima K, Uji A, Ogino K, Horii T, et al. Macular migration toward the optic disc after inner limiting membrane peeling for diabetic macular edema. Invest Ophthalmol Visual Sci 2013; 54(1): 629-635. Ohta K, Sato A, Senda N, Fukui E. Displacement of fovea toward optic disk after macular hole surgery with internal limiting membrane peeling. Int Med Case Rep J 2017; 10: 345-348. Steel DH, Dinah C, White K, Avery PJ. The relationship between a dissociated optic nerve fibre layer appearance after macular hole surgery and Muller cell debris on peeled internal limiting membrane. Acta Ophthalmol 2017; 95(2): 153-157. Scupola A, Grimaldi G, Abed E, Sammarco MG, Giudiceandrea A, Greco A, et al. Arcuate nerve fiber layer changes after internal limiting membrane peeling in idiopathic epiretinal membrane. Retina 2017; doi: 10.1097/IAE.0000000000001768. Ganguly A, Tang Y, Wang L, Ladt K, Loi J, Dargent B, et al. A dynamic formin-dependent deep F-actin network in axons. J Cell Biol 2015; 210(3): 401-417. Morawski K, Jedrychowska-Jamborska J, Kubicka-Trzaska A, Romanowska-Dixon B. The analysis of spontaneous closure mechanisms and regeneration of retinal layers of a full-thickness macular hole: Relationship with visual acuity improvement. Retina 2016; 36(11): 2132-2139. Golan S, Barak A. Third time spontaneous closure of myopic macular hole. Retin Cases Brief Rep 2015; 9(1): 13-14. Lam D, Srour M, Semoun O, Tilleul J, Souied EH. Resolution of a macular hole complicating a pseudophakic macular edema with nonsurgical treatment. Retin Cases Brief Rep 2016; Doi: 10.1097/ ICB.0000000000000446. Lescrauwaet B, Duchateau L, Verstraeten T, Jackson TL. Visual function response to ocriplasmin for the treatment of vitreomacular traction and macular hole: The OASIS study. Invest Ophthalmol Vis Sci 2017; 58(13): 5842-5848. Helb HM, Charbel Issa P, Fleckenstein M, Schmitz-Valckenberg S, Scholl HP, Meyer CH, et al. Clinical evaluation of simultaneous confocal scanning laser ophthalmoscopy imaging combined with high-resolution, spectral-domain optical coherence tomography. Acta Ophthalmol 2010; 88(8): 842-849. Wolf-Schnurrbusch UE, Ceklic L, Brinkmann CK, Iliev ME, Frey M, Rothenbuehler SP, et al. Macular thickness measurements in healthy eyes using six different optical coherence tomography instruments. Invest Ophthalmol Vis Sci 2009; 50(7): 3432-3437. Sheehy CK, Tiruveedhula P, Sabesan R, Roorda A. Active eye-tracking for an adaptive optics scanning laser ophthalmoscope. Biomed Opt Express 2015; 6(7): 2412-2423.